Anyway, I got a couple of concerts here coming up (after exams).. so if you're interested, tell me next prac yeah? 4 Sep 7.30pm5 Sep 3pm & 8pm. $35, $30, $25;$15 for 3pm show only. 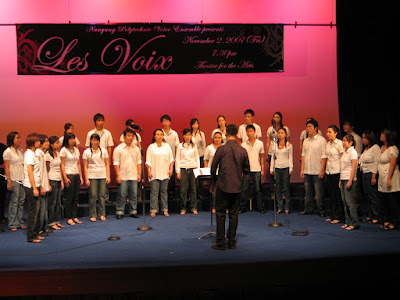 The 2007 A Cappella Festival will showcase a kaleidoscope of talent from the very young to the professional. In its 5th installment, this annual musical buffet provides a platform presenting the veterans in the community like Key Elements, nanu and Equivox plus past National Champion winners. 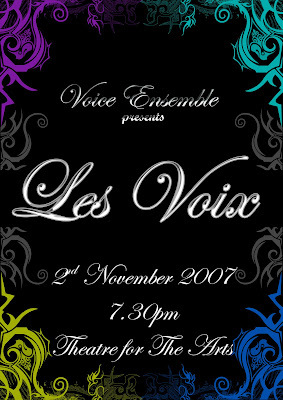 Directed by Vincent Pang, the 2007 programme aims to mold a-cappella music with video and digital images to the theme of "Sonic Landscapes". Plus, this year will include for the first time an afternoon show for kids targeting primary and early secondary school kids, giving them an opportunity to experience a live concert. Be entertained in the genres of classical a-cappella, pop, jazz, R&B and hip hop a-cappella, as well as rap, from guest groups SJ Tone (Korea) and Wicked Pitches (Malaysia), plus Nanu (all female), Key Elements (Jazz), Tic Tac Tone, The Singers (Classical), Equivox (Pop), TAG, TAS Youth Voices, TAS Ensemble, National Winners 2007, Pasir Ris Primary School Choir, Ang Mo Kio Secondary School Choir. moons, and vocally dance the night away. Okie dokies! All the best for rest of your exams. Just a reminder that there'll be no practice starting from next week due to exams. The first practice after exams will be 3rd September, Monday, 7.30pm @ e309. For juniors (girls) who's helping out in concert as sub-committee for wardrobe, please do not forget to turn up this Sat, 11 August, 12pm @ AMK MRT control station. 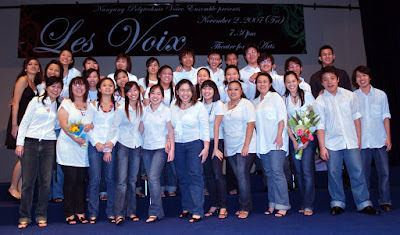 We'll be heading down to thomson road to select the cloth for our choir gowns. As for the rest, you are very much welcome to join us this weekend, including guys (cos some guy seniors will be coming too). Please bring extra cash cos we will be having lunch before heading to the place. Haha.. maybe dinner/outing after that.. so please inform us if you wanna come! As I've mentioned before during announcements, practices will be twice a week (Mondays and Fridays) starting from the month of september til concert in november. And most importantly, we'll be taking attendance really seriously this time - if anyone fails to fulfil the 80% attendance, the ve comm has the right to strike your name off concert performance. However, if you had valid reasons - taking into account that you've learnt your parts well and taken note of what you've missed, we'll still allow you to perform. I hope to see that each and everyone of you exercise responsibility. Always respond to our messages. If you missed one of our practices, find out what you've missed. Like to emphasize that we aren't a cca that allows you to come-and-go-as-you-like. If that's your mind-set, kindly change it or we'll have to ask you to leave. Also, I do not tolerate members who go missing for a long time without responding to none of our msgs. If you wish to quit, simply call us straight and say so. Please do not beat around the bush and come up with excuses one after that other - Stop wasting yours and our time & efforts. Also, concert camp will be on 1st - 3rd October. (Yup, it's an overnight camp) Please mark it down on your calendars and this is a compulsory one cos we'll be doing drilling of concert pieces plus choreography!